The U.S. dollar has made some impressive gains of late, brightening the outlook in general with the hope that economic and political fundamentals continue to improve in the years to come. I've borrowed the title of this post from my good friends Larry Kudlow and Steve Moore, and I think this post makes a nice complement to their recent column in National Review Online. Against a trade-weighted basket of major currencies, the U.S. dollar has risen over 15% from its all-time low of three years ago, and over one-third of that increase has come in the past three months (see chart above). 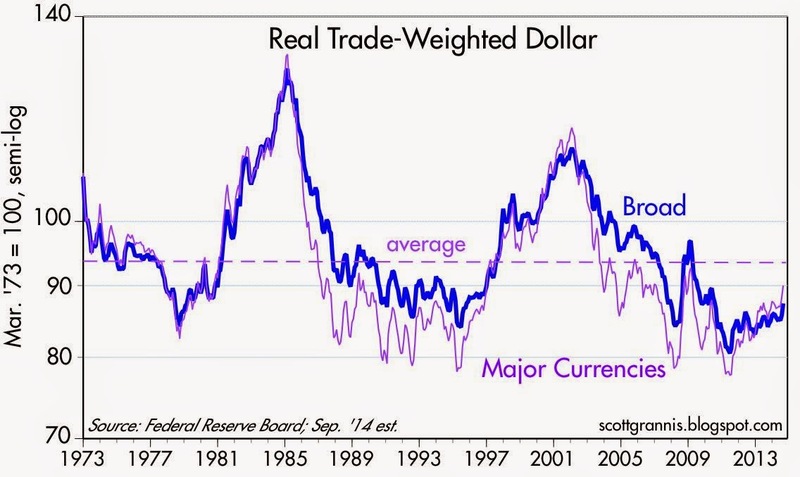 It's been an impressive rally of late, but as the chart above shows, from a long-term perspective the dollar is still relatively weak, whether measured against a trade-weighted, inflation-adjusted basket of major currencies or against a similar basket of more than 100 currencies (see chart above). Relative to its all-time high of May, 1985, when the economy was booming and the Fed was fighting inflation with sky-high interest rates, the dollar today is almost 30% weaker. Relative to the early 2000s, when the economy and equity markets were booming and the Fed was fighting the specter of rising inflation, the dollar today is about 20% weaker. The following charts focus on the dollar's strength and weakness relative to five major currencies, by comparing their current (spot) value to my calculation of their Purchasing Power Parity value. PPP theory holds that, over time, currencies move vis a vis others in a way that reflects changes in relative prices between between countries. Currencies that depreciate against others typically have higher inflation rates, and currencies that appreciate have lower inflation. For each currency I've picked a base year in which I thought that prices were in rough equilibrium, then adjusted that value over time for changes in relative inflation rates. The current PPP value of each currency is therefore approximately equal to the exchange rate that would produce roughly equal prices for a given basket of goods and services in each country. 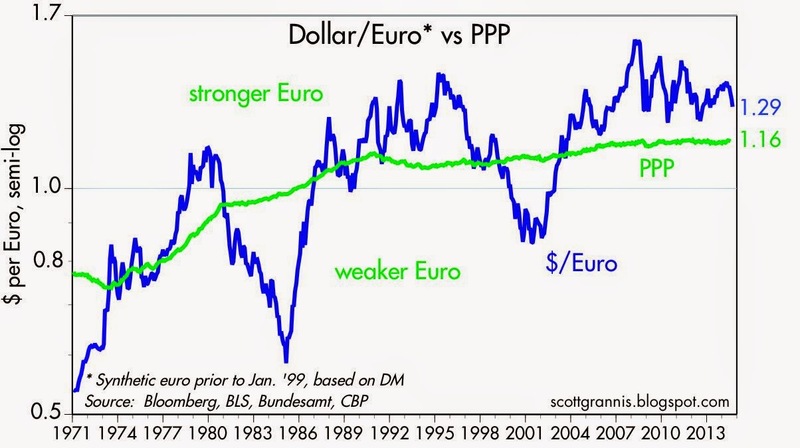 By my calculations, the current PPP value of the Euro vis a vis the dollar is about 1.16 dollars per Euro. Since the Euro is currently trading at 1.29, that implies that a U.S. tourist visiting the Eurozone today would find that goods and services there cost about 10% more than in the U.S. on average (1.29/1.16 = 1.11). As for Sterling, my calculations suggest that goods and services in the U.K. today cost about 25% more than they do in the U.S. 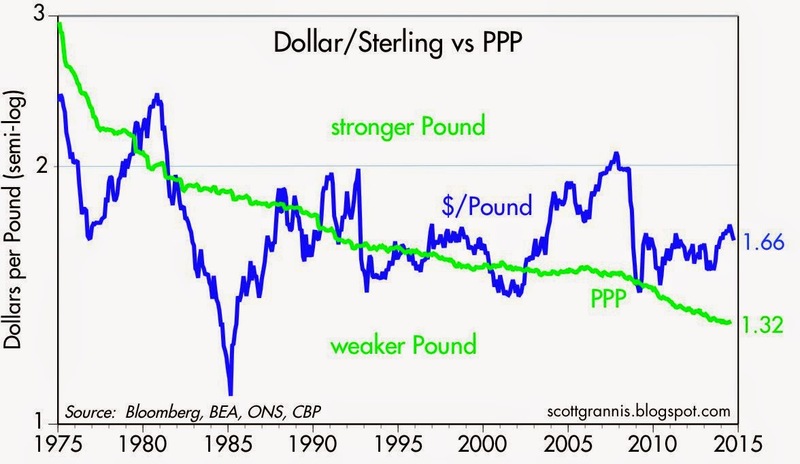 In other words, the pound is about 25% "overvalued" relative to the dollar. The fact that the green line has been sloping down for the past several years tells us that U.K. inflation has been higher than U.S. inflation, and that over time the pound is therefore likely to fall relative to the dollar, all other things being equal. The yen has experienced a rather dramatic weakening over the past three years, falling from a high of 75 to almost 109, for a loss of over 30% against the dollar. Big currency losses like this are rarely good news, but in this case the big drop in the yen has coincided with huge gains in the Japanese equity market, as the second of the above charts shows. 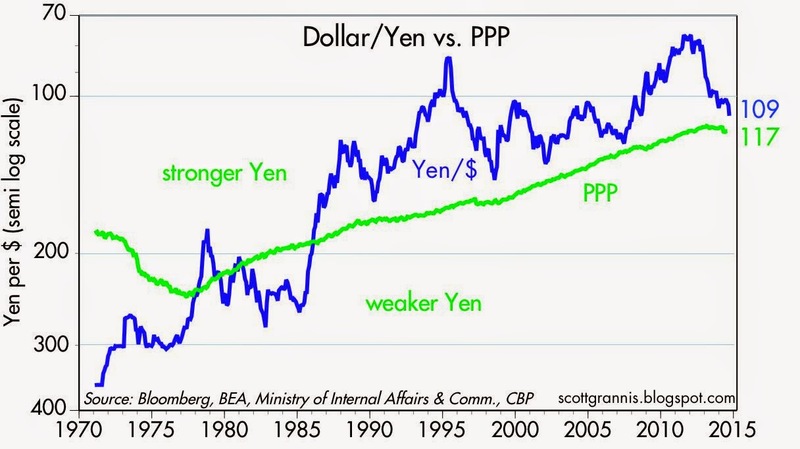 I think that's because the yen had been so strong for so long against almost every currency on the planet that it had created deflationary pressures which were suffocating the economy. 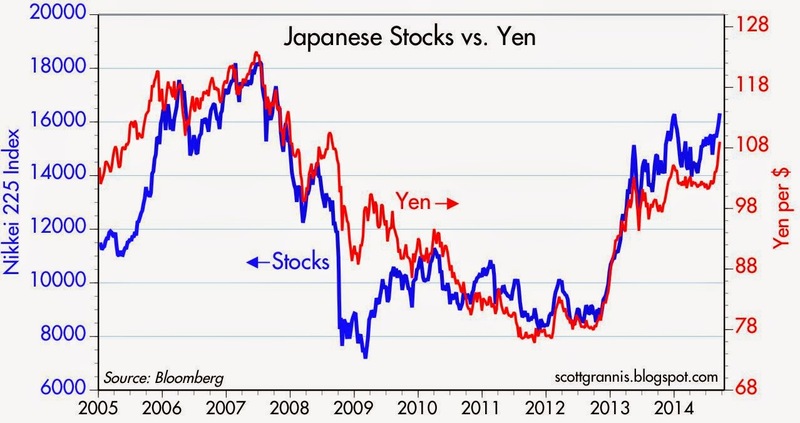 The yen's relentless appreciation over the previous 40 years made life very difficult for Japanese industry, for example, since they had to continually cut their costs to remain competitive with overseas manufactures. Now that the yen is closing in on its PPP value relative to the dollar, and the Abe administration is pursuing more growth-oriented fiscal policies, it's become very good news for the Japanese economy and for the world. The story is quite similar for the Canadian dollar, since Canada is also dependent on commodities, although not as much as Australia. I figure the loonie is still almost 20% "overvalued" against the U.S. dollar. 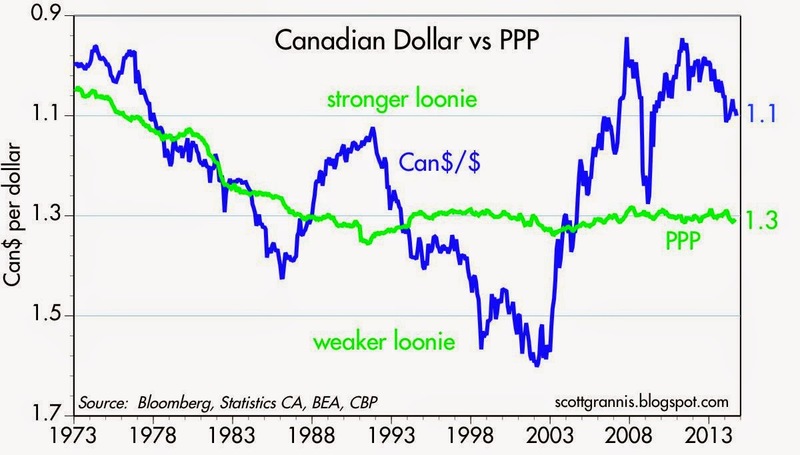 As the chart above shows, Canadian inflation has been almost identical to U.S. inflation over the past 20 years, which makes it likely that eventually the loonie will weaken further against the dollar. 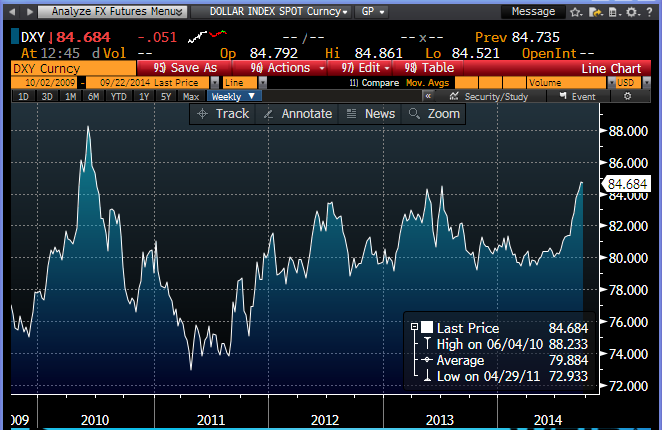 Why was the dollar so weak three years ago? The list of possible causes is long, but I think the important ones are 1) fears that the Fed's QE efforts would debase the dollar and lead to higher inflation; 2) fears that trillion-dollar federal budget deficits would prove to be the norm and that in turn would lead to a significant rise in U.S. tax burdens; and 3) fears that an onerous increase in regulatory burdens under Obamacare and Dodd-Frank would weigh on the economy; and 4) fears that the U.S. economy was vulnerable to a double-dip recession. We've still got lots of problems to deal with (and the dollar is still weak), but we now know that the Fed hasn't (yet) made a big inflation mistake, and is on the verge of ending QE and beginning to normalize short-term interest rates. We also know that the federal budget deficit has fallen by two-thirds and is currently quite manageable. Moreover, the debate over entitlement spending, which holds the key to the long-run budget outlook, is now centered around when and by how much spending can be cut, not whether. The ongoing failure of Obamacare and the long list of bureaucratic scandals in recent years have convinced a majority of the people that we suffer from too much, not too little government. Too much government killed Greece, and it's killing Venezuela and Argentina as we speak. Finally, the U.S economy has managed to grow by a relatively steady 2% pace for the past five years, and has been able to grow despite pronounced weakness in the Eurozone and a significant slowdown in the Chinese economy. In short, things have turned out much better than the market feared. Looking ahead, it's now pretty clear that the Fed is going to pursue tighter monetary policy than the ECB, the BoE, and the BoJ. Interest rate differentials are moving in favor of the dollar (i.e., U.S. short-term rates are rising relative to overseas rates) in anticipation of this, and that has also helped boost the dollar, as the chart above shows. So even though the U.S. economy is saddled with a very uncompetitive tax system, a hugely burdensome regulatory environment, and an abysmally low labor force participation rate, it's doing better than most other countries. In short, things haven't turned out nearly as bad as the market feared. Investment implications. With the outlook improving on the margin and the dollar rising on the margin, U.S. investments look attractive relative to non dollar investments. Commodity prices are likely to weaken further if the dollar continues to strengthen. This is unlikely to be bad news for emerging market economies, however, because the dollar will be strengthening, and interest rates will be rising, as the outlook for the U.S. economy improves. A stronger dollar that results from overt and aggressive Fed tightening can be very bad news for emerging markets, since it presages a sharp slowdown in the U.S. economy—that was the case in the early 2000s. Every recession in the past 50 years has followed a period of very tight monetary policy, as evidenced by high real interest rates and a flat or inverted yield curve. We're years away from that. 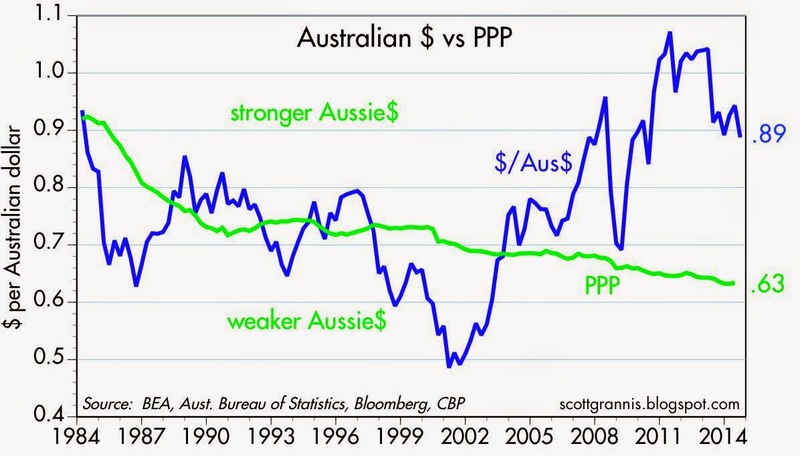 As the PPP charts above suggest, the currencies with the most to lose potentially against the dollar are the Aussie dollar, the Canadian dollar, and Sterling. 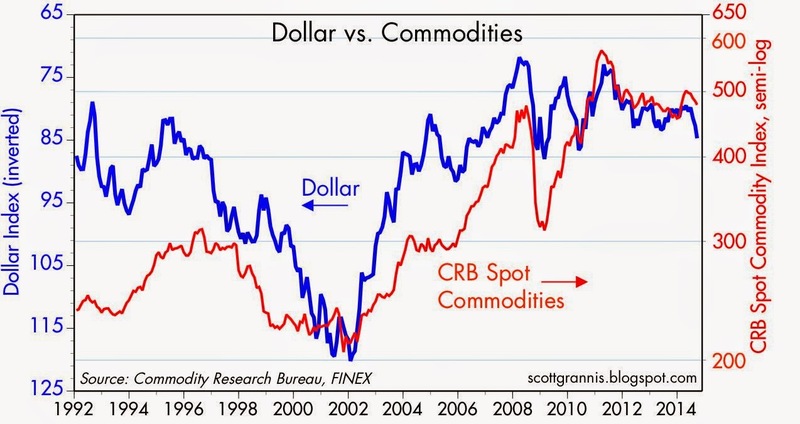 A stronger dollar would most likely lead to weaker commodity prices, especially so in the case of gold. 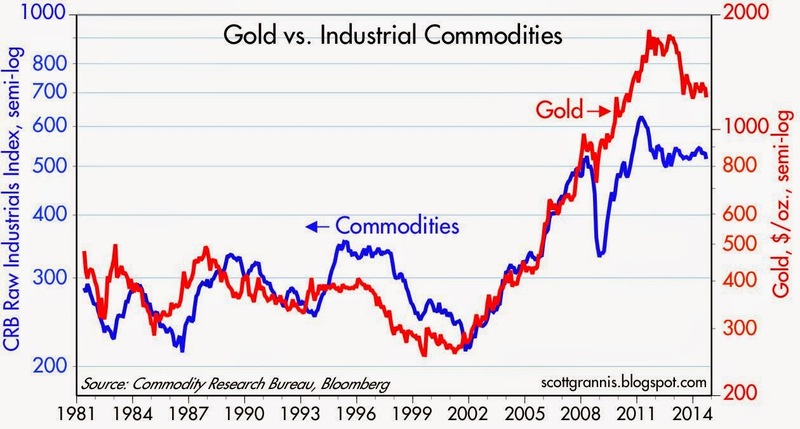 As the chart above suggests, gold prices "overshot" commodity prices in the wild and wooly days following the near-collapse of global financial markets during the depths of the Great Recession, and the onset of the Fed's unprecedented expansion of its balance sheet. Fortunately, the world has emerged intact, the dollar has not been debased, and inflation remains low. Without a great deal of fear to sustain it, gold prices are unlikely to sustain their still-lofty levels. In the absence of any new fears, gold is likely to converge back down to commodity prices. I take it then that anyone invested in Aus or Canadian equities or to decamp and put the lot in US stocks? With commodities going down and will keep going down and demand going down in the rest of the world is it even possible for inflation to go up? Oil going down, iron and metals going down, durable goods going down.. where would the inflation come from? Thanks. I recently took an international finance course at Marginal Revolution Univ. and am interested in your estimates of PPP. Do you use the same basket of goods for each country? If the list isn't too long, could you share what those are? I read your blog daily and find it valuable, but I don't comment often. Keep up the good work. These are the measures of inflation I use: for the U.S., the PCE deflator; for Australia, the CPI All Groups Goods Component; for Canada, the CPI; for the Eurozone, the German CPI; for Japan, the CPI Nationwide General; for the UK, the RPI less Mortgage Interest Payments. Roy: in my experience, inflation and weak growth are more often found together than inflation and strong growth. It's a myth that strong growth leads to inflation and weak growth leads to deflation. In any event, if inflation rises in coming years, it will be because increased confidence will cause the demand for money to decline, and the Fed will be slow to tighten policy in response. 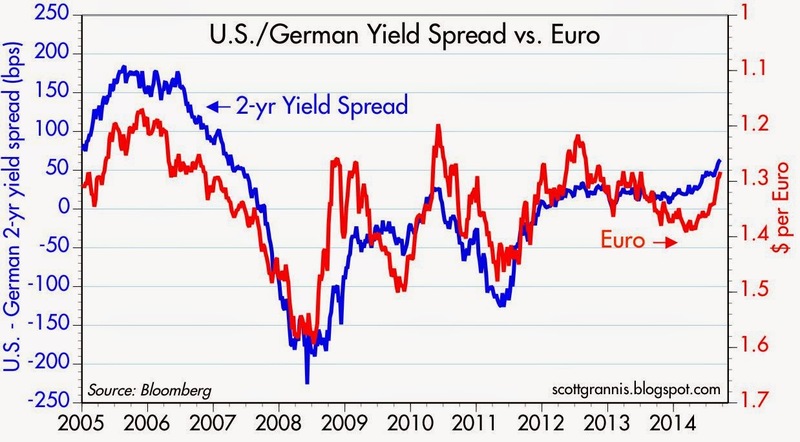 With the USD being reserve currency, it will have to absorb all the deflation pressure coming from Europe and friends. The stronger the USD the bigger the pressure. Oil will keep going down thanks to output increase in the US will weakening demand elsewhere. Commodities going down due to the China over-investment-drive slowing down. There's no inflation coming even if the Fed do not "tighten".